At our Hair Solved Salon in Belfast we understand how distressing hair loss is for women of all ages. Within the comfort of our discrete hair loss studio, our highly trained technicians and stylists change women’s lives with our innovative hair loss treatment, the Enhancer System. At Hair Solved, Belfast our friendly and expert team will work closely with you to ensure you get the beautiful, natural results you are hoping for. 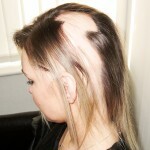 We understand female hair loss and will ensure you feel comfortable at our stylish and private hair loss studio. Whether you currently have a system in place or are at the very beginning of your search for a hair loss salon in Belfast, don’t hesitate to get in touch for a free, no-obligation consultation today. Our women’s hair loss salon in Belfast is easily accessible by public transport, please call us on 02890 683005 and we will be happy to help with directions.